This question has been a hot topic waiting in line for awhile now and has been asked many times at Drywall Pro-Finishing: How drywall is made and what is it? Today we are going to discuss exactly this! Drywall also known as plasterboard, wallboard, or gypsum panel is panel made of calcium sulfate dihydrate (gypsum) typical included with sheets of backer paper that used to construct interior walls and ceilings. Based on the project, foam, insulation, and fiber is added to make it more sturdy. Our professional drywall constructors know what material to use best when beginning a project and while continuing constructing the wall. Over the years, drywall is becoming more and more popular in the Greater Toronto Area (GTA) & beyond as a source to create walls because of its reliability, money value and flexibility for the construction of multipurpose rooms. In other words, Drywall is made of layers of plasterboard that is coupled with insulation to create rooms within a property. These drywall panels are manufactured in 48-inch (1.2 m), 54-inch (1.4 m) and 96-inch (2.4 m) wide panels in varying lengths to suit the application, though 48-inch is by far the most common width. Lengths up to 16 feet (4.9 m) are commonly available, though the most common length is 8 feet (2.4 m). Common panel thicknesses are 1⁄2-inch (13 mm) and 5⁄8-inch (16 mm), with panels also available in 1⁄4-inch (6.4 mm), 3⁄8-inch (9.5 mm), 3/4-inch (19.0 mm) and 1-inch (25.4 mm) for specific applications. Paper drywall tape or fiberglass drywall tape. Metal or paper-faced corner bead. As you may observe there is a lot that comes into play when constructing drywall. We strongly urge you to take safety and precaution into consideration. Why not let the professionals take over and save time & money instead? At Drywall Pro-Finishing we take all the necessary steps needed to create the beautiful room that you have been looking for all this time. Our professional workers will be more than glad to explain to you how it works and what is needed and have your project completed in a timely manner. 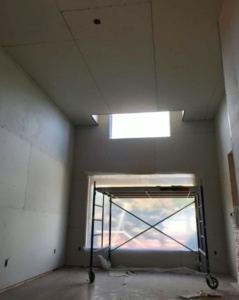 Indeed, having the tools and material ready is not enough, there is also the know-how of putting the drywall into place and we extensive experience it this. It is putting up the boards when it becomes challenging and we are here to do this for you and take over so that you may sit back, relax and watch your property develop. If have any questions or would like to get in touch, we would love to hear from! Why not pick up the phone or contact us today to hear about how we can finish you drywall project right away? Simply click here or contact us today at 416-889-3927 and let us take over and finish your property projects for you. Stay tuned for more drywall-related info, news, advice & much more from Drywall Pro-Finishing! This entry was tagged drywall, how, made, toronto. Bookmark the permalink.